Whether we're hosting a series of seminars or engaging in panel discussions, we always ensure our clients and friends are educated on current tax information, internal controls, basic accounting topics and other subjects to help meet their fiduciary and financial responsibilities. And reference our past seminars and resources here! For media or press inquiries please email media@btr-cpa.com. The Falmouth Chamber - Business After 5! We are so excited to be starting off the new season by co-hosting Falmouth/Cumberland Community Chamber of Commerce Business After 5!. Join us Burgess Advertising & Marketing and Barns Greenfield & Thorton for food, drinks, and networking! Burgess Advertising & Marketing was co-founded in 1986 by its Owner and President, Meredith Strang Burgess, and its Creative Director, Oliver Payne. The agency specializes in strategic campaigns for Maine companies and organizations, which have included, through the years: Central Maine Healthcare, Dielectric, Efficiency Maine, Maine Bank & Trust, Maine Health Access Foundation, Mercy Hospital, New England Cancer Specialists, Oakhurst Dairy, and Portland International Jetport. Barns, Greenfield & Thornton is a dynamic law firm based in Falmouth, Maine. They focus on personalized service in the areas of real estate, commercial transactions, and general civil matters. 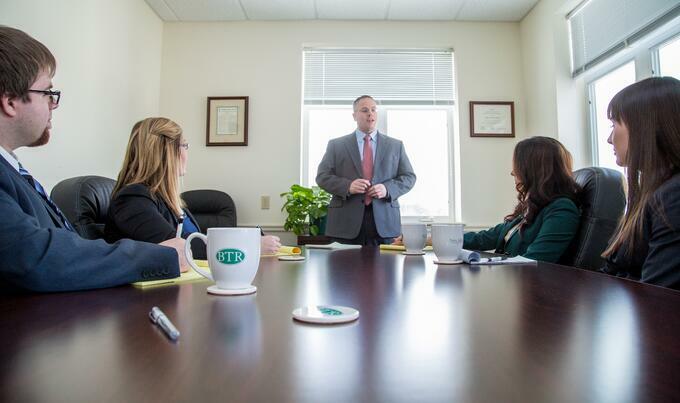 Their size and location allow them to provide cost-effective solutions to meet the diverse legal needs of businesses and individuals throughout the State of Maine. Catering and cash bar provided by Ricetta's. There will be several special door prize drawings - a $100 gift certificate to Hugs Restaurant from Berry Talbot Royer and an Amazon Kindle Paperwhite 6" WiFi from Burgess!! As a courtesy for our hosts please register by September 17th!